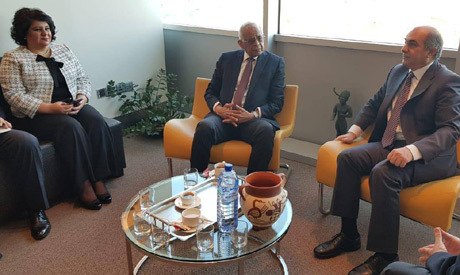 An Egyptian parliamentary delegation led by House Speaker Ali Abdel-Aal arrived in Cyprus Sunday in a visit aimed at reinforcing relations between Egypt and Cyprus, according to a statement. A meeting between the speakers of parliaments of Egypt, Greece and Cyprus will be held in Nicosia on Monday. "This is the first meeting to comprise the speakers of parliaments of the three countries," said the statement. Political relations between the three Mediterranean countries have grown steadily since Egyptian President Abdel-Fattah El-Sisi came to office in 2014 and after Egypt has recovered stability after five years of political upheaval. The leaders of the three countries have held around five summits to reinforce relations. The discovery of huge quantities of natural gas in the Mediterranean waters of Egypt and Cyprus and the demarcation of maritime borders between them have strengthened relations between the two countries. Tensions between Egypt and Turkey have also made relations with Greece stronger. The two countries have conducted several joint military exercises in the Mediterranean. Speaker Abdel-Aal said that the meeting tomorrow will focus on discussing economic, parliamentary, political and legislative relations between the three countries to reinforce strategic partnership.